Tennessee notched a huge series win over the Aggies this weekend. In a weekend all about Tennessee football, the Volunteers baseball team (25-17, 8-10 SEC) hosted the No. 14 ranked Texas A&M Aggies for a three-game series. After winning two of the three games, Tennessee secured the series win. Sunday’s victory marked the Vols first series win over a ranked opponent since clinching a series against Florida more than one year ago. Tennessee freshman Sean Hunley performed dominantly in game one. In five innings of work, Hunley allowed just three runs on seven hits while also striking out five batters. Freshman pitcher Chase Wallace replaced Hunley in the sixth inning and went on to strikeout four batters, only allowing one run on two hits. The Sevierville native captured his first win of the season Friday night. 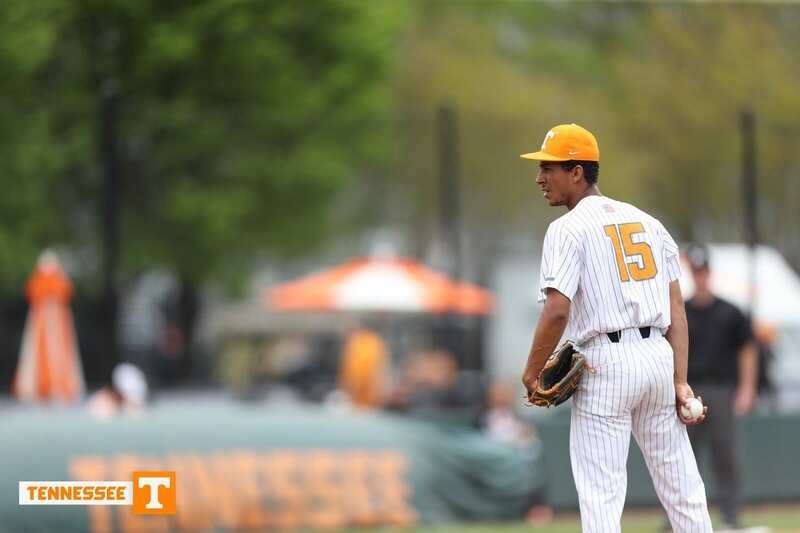 The Vols heated up their bats early, as they scored three runs in the first inning. Sophomore Pete Derkay hit an RBI single scoring sophomore Jay Charleston. Sophomore infielder Andre Lipcius homered to right center field to bring in Derkay. After the Aggies tied the game in the fifth inning, Tennessee took the lead back in the sixth inning off a sacrifice fly from freshman Evan Russell. Senior Brodie Leftridge homered in the seventh inning, pushing the Volunteers lead to 5-3. Derkay and sophomore Will Heflin both scored in the eighth inning, giving Tennessee a 7-4 lead, which would remain the final score. The orange-and-white dropped game two. The Aggies scored five runs in the first inning and never looked back. Tennessee didn’t get on the scoreboard until the eighth inning, and the Vols’ chances of coming back dwindled away. Texas A&M went on to win the game 8-3. In the final game of the weekend, Tennessee fell behind early after the Aggies scored two runs in the first inning. However, the Vols got back on track in the third inning after scoring three runs to take a one-run lead. The Aggies scored two more runs in the seventh inning, but their runs did not secure the win. Tennessee scored in the sixth and seventh inning to win the game 6-4 and clinch the series win. Junior pitcher Will Neely pitched 5.2 innings. Freshman Garrett Crochet replaced Neely on the mound. After tossing for 2.2 innings and striking out four batters, Crochet came away with the win. Wallace replaced Crochet in the ninth inning to earn his third save of the season. Vols Head Coach Tony Vitello commended his team on avoiding errors in the wins. Tennessee’s next game will be against No. 25 Tennessee Tech on Tuesday and can be watched on SEC Network+.